“God sleeps in the stone, dreams in the plant, awakes in the animal, takes conscience in men”, we can read at the beginning of the book “An Hour with Creation”, Franz Weber’s last publication (2009). With this Indian proverb, the author remembers the categorical imperative from Emmanuel Kant, which says we must only act under the principles that we wish to become a universal law. But even furthermore Kant’s moral philosophy, Franz Weber follows another philosopher’s precepts, Arthur Schopenhauer, he goes beyond the idea that only men have a reasonable nature and he includes in it all living beings. The formal difference between men and animals vanishes. “We will finally learn how to communicate with animals, plants and everything that loves and vibrates around us, we will be able at last to coexist in harmony, to be in symbiosis with them, to live with them in the actual meaning of the sentence”, Franz Weber is convinced. Since fifty years ago he fights for a morally acceptable approach to animals and nature. “Like for most Swiss people, to me you embody the environmental protection in the most accurate of senses, even before this concept became popular as it is today”, wrote the ex-President of the Swiss Confederation, Moritz Leuenberger, about the famous Swiss environmental defender. Jean Ziegler, expert in Human Rights at the UN, describes Franz Weber as “one of the greatest and most significant Europeans from our time”. “I am a defender of natural environments”, is the definition that according to Franz Weber suits him well, today at the age of 90 years and with all modesty, that’s the tittle he gives to his amazing and exceptional work. These pages aim to pay him tribute with a few examples (among so many!). 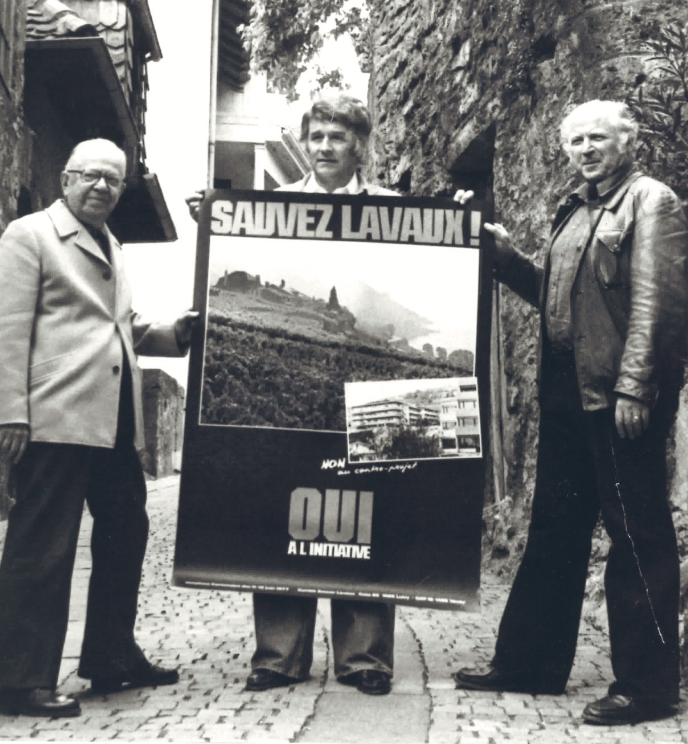 Photo: Initiative “Sauver Lavaux”: Franz Weber with the great Vaud writers and poets, Jean Villard Gilles, left and Henri Deblüe, right.